One of my favorite devotionals is Oswald Chambers’ book, My Utmost for His Highest (Click the link to go to the online version). I would encourage you to read it daily, if you have time, as it is a daily devotional. They are short and sweet devotions all based on the Word of God to live a life in His Spirit. Yesterday’s devotion really ties well into what I wrote this morning on being redeemed and forgiven from all our sins. If you missed that post here it is: Who Am I? I Have Been Redeemed and Forgiven of All My Sins. So, on to the devotion. I probably shouldn’t post the full devotion due to copyright issues, but if you click the link above that website should have all of the devotions for you to read. I do, however, wish to include an excerpt of that devotion, because it focuses on redemption. He introduces his devotion with a verse. “The Cross was not something that happened to Jesus— He came to die; the Cross was His purpose in coming. He is “the Lamb slain from the foundation of the world” (Revelation 13:8). The incarnation of Christ would have no meaning without the Cross. Beware of separating “God was manifested in the flesh…” from “…He made Him…to be sin for us…” (1 Timothy 3:16 ; 2 Corinthians 5:21). The purpose of the incarnation was redemption. God came in the flesh to take sin away….. The Cross is the central event in time and eternity, and the answer to all the problems of both. The heart of salvation is the Cross of Christ. The reason salvation is so easy to obtain is that it cost God so much. The Cross was the place where God and sinful man merged with a tremendous collision and where the way to life was opened. But all the cost and pain of the collision was absorbed by the heart of God.” – Oswald Chambers, My Utmost for His Highest, April 6th: The Collision of God and Sin. Not only did he pay the debt we owe to God, he also took our place. Christ died for man, in man’s place, taking man’s sins and bearing them for man. The bearing of man’s sins takes the punishment for them and sets the believer free from the penal demands of the law: The righteousness of the law and the holiness of God are satisfied by this substitution (Isa. 53:4-12). 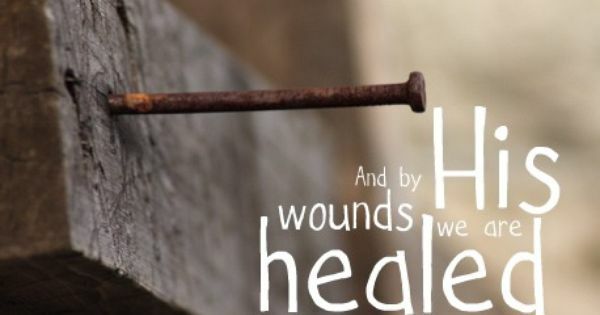 He was pierced for our sin, he was crushed for our sin, and we deserved what he received. Yet by the grace and providence of God, Christ’s sacrifice satisfies God’s justice, pardons us from guilt, and gives us the righteousness of the Son of God. O praise the one who paid my debt and raised this life up from the dead!